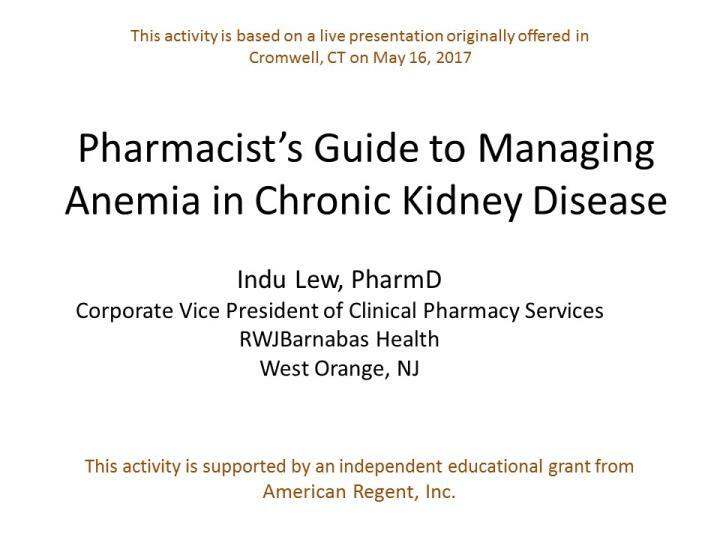 To educate participants on the treatment recommendations and goals for patients with anemia and chronic kidney disease. The session will begin with an overview of chronic kidney disease including delineation of stages, epidemiology, and complications. Particular focus will be on anemia in CKD – its causes, symptoms, diagnosis and treatment. The guidelines for managing anemia in CKD and available medications will be covered in detail. The discussion of treatment options will outline dosing, administration routes, warnings and contraindications, potential adverse effects, and monitoring. Participants will have an opportunity to review patient cases and select the appropriate treatment strategy for each. Dr. Lew is on the speaker’s bureaus for American Regent and Amgen; presenter is also on the Advisory board of Novartis. Reviewer: Darren Grabe, PharmD; Associate Professor of Pharmacy Practice, Albany College of Pharmacy; Adjunct Assistant Professor, Albany Medical College; Albany Nephrology Pharmacy Group, Albany, NY. Dr. Grabe does not have any relevant financial relationships with any commercial interests. Explain the impact of anemia on quality of life and mortality risk. Compare and contrast therapies used in the management of anemia in patients with CKD. Discuss laboratory tests and monitoring parameters used to evaluate anemia. Identify a treatment plan for management of anemia based on patient specific factors.